Yum! Yum! 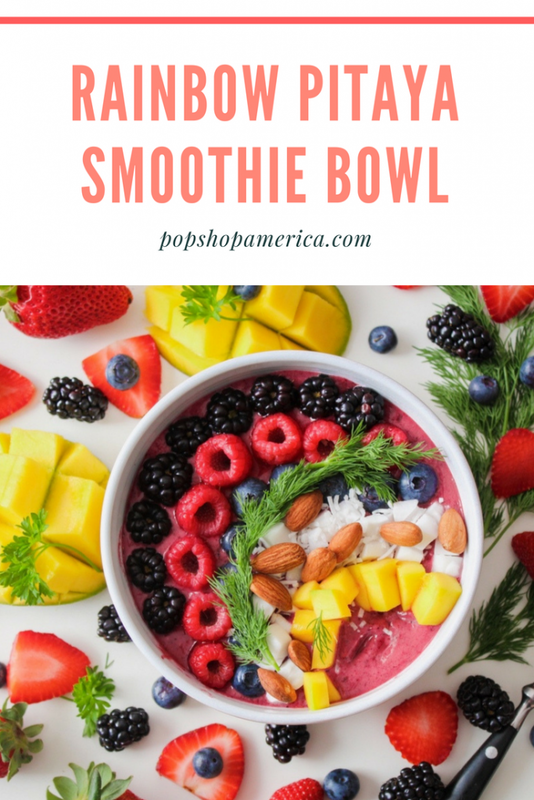 This Homemade Rainbow Pitaya Smoothie Bowl can make the perfect breakfast and the perfect snack. It’s all rainbow colored, healthy, and so pretty! 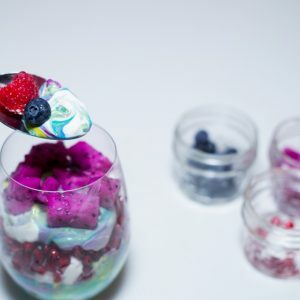 You can incorporate many different fruit, seed and nut toppings. You don’t have to use the exact same ones that I used! What I love about this Homemade Rainbow Pitaya Smoothie Bowl is that it’s summer perfect. 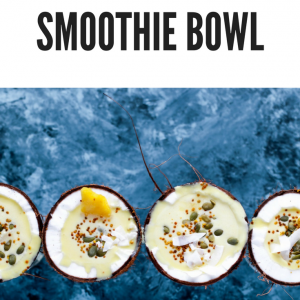 Smoothie bowls are cooling, light, quick and easy to make, and really healthy too. If you haven’t gotten excited about Dragonfruit yet, this is your chance! 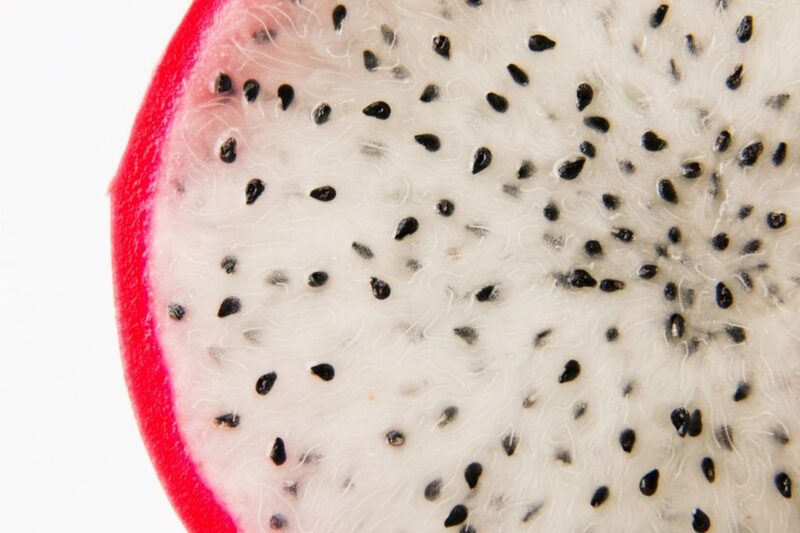 Whether you call it pitaya or dragonfruit, this adorable little fruit is totally exotic and delicious. Pick one from your grocery store that is slightly soft and free from brown blemishes. Be sure that the stem is not dry. 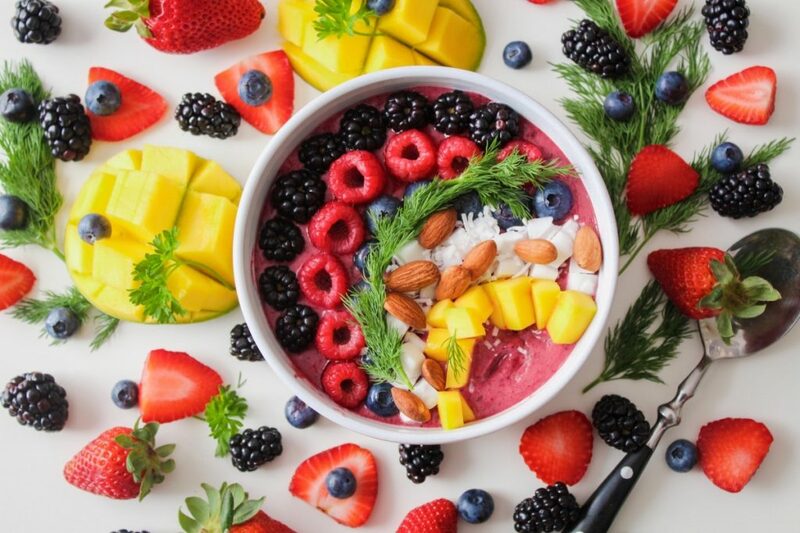 Pitaya is the perfect ingredient for smoothie bowls because it aids in digestion and can help improve your metabolism. It has unique and powerful antioxidants and is rich in vitamins B & C. One of my favorite things is how totally dang cute they are! 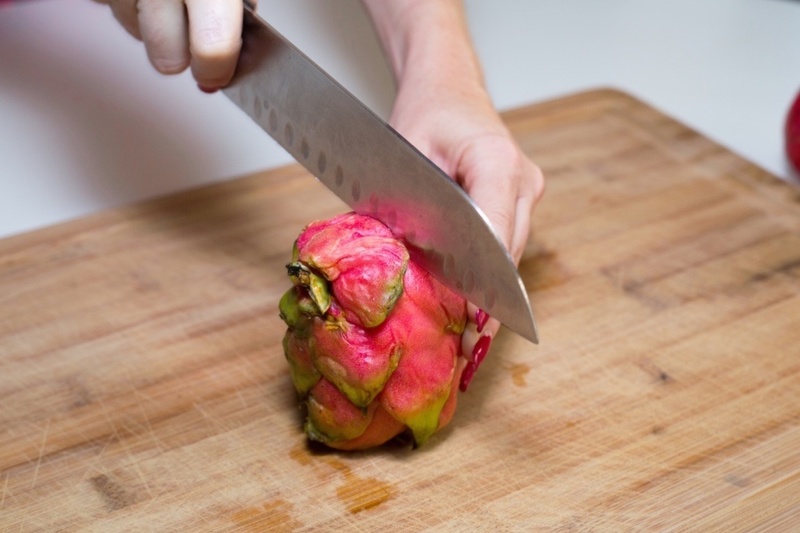 You can find dragonfruit in pink, yellow, and white fleshy insides. You can also find frozen pitaya at the grocery store which you could use for this recipe too. I used fresh because it’s so tasty! Whether you use fresh or frozen, be sure that some part of your base is frozen so that it will be nice and cold. It could be frozen pitaya, frozen banana, or frozen cubes of coconut milk. The choice is yours. I went with fresh pitaya, chilled coconut milk, and frozen bananas. And speaking of frozen bananas…. 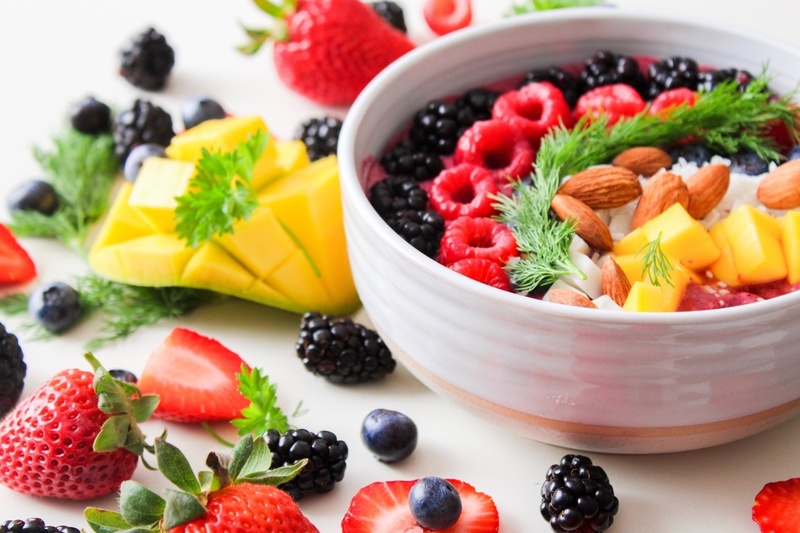 Once your basic smoothie bowl is done, it’s all about layering gorgeous fruit, seeds, and nuts on top! 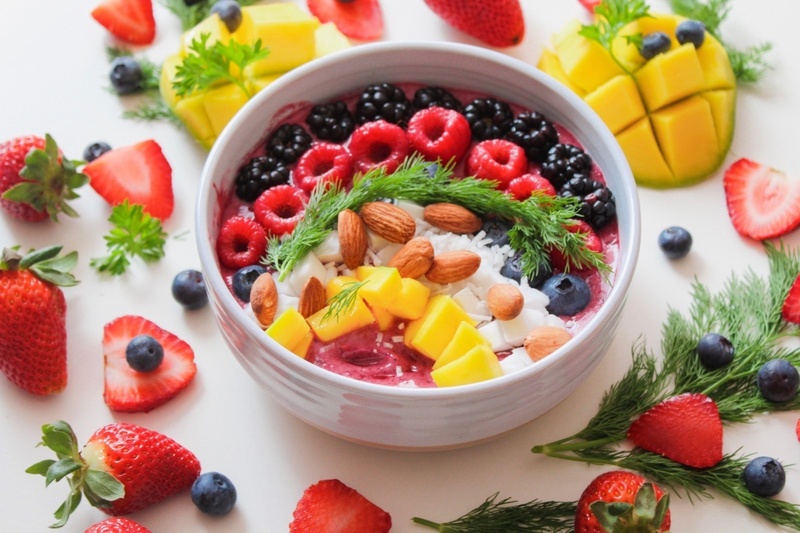 If you want your Homemade Rainbow Pitaya Smoothie Bowl to look picturesque, start with the smallest edge, in this case the mango and work your way to the other side. For my Homemade Rainbow Pitaya Smoothie Bowl I used mango, coconut, almonds, blueberries, raspberries and blackberries. The dill is just for show! I’m not sure it would be tasty but it sure is pretty! Below you will see the printable recipe. I hope your enjoy your Pitaya Smoothie Bowl. 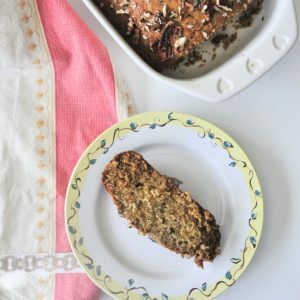 If you are looking for a way to pair this, for a full breakfast try it with the Berry Toast!